An exciting coffee table duo named ‘Pause and Wait’ is one of the flagship ranges to be unveiled in Lyndon Design’s inspiring new ‘Tables Edit’. A natural extension to the company’s revered upholstered seating collections, these handcrafted tables are designed to complement a variety of commercial interiors including; hospitality, leisure, breakout and reception spaces. Whilst delivering a subtle and understated expression, both are key to inspiring rest and relaxation, as well as connecting seamlessly with other furniture pieces. Boasting the uncompromising quality standards that characterise all of Lyndon Design’s collections, both tables feature a solid timber underframe and circular top in European Oak with square leg detail that oozes elegance and enduring appeal. Pause and Wait can be used individually to highlight their unique qualities, or can stand side by side to create a stunning design statement. 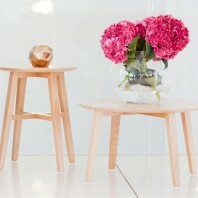 Set at different heights, Pause is the taller of the two at 500cm high, and with its 450cm diameter top and crossed leg detail, it offers the perfect side table. In contrast, the Wait coffee table sits at just 350cm high, and with a generous 600cm diameter wooden top, it presents an equally refined and poised arrangement. Lyndon Design’s Managing Director, Tim Armitt, comments: “Whether used to create a statement piece or an accompaniment to other furniture, Pause and Wait certainly live up to their name by inspiring users to sit back, relax, pause and wait. “The unveiling of this dynamic duo is in response to the increasing demand for coffee and occasional tables throughout interior spaces. Not only do Pause and Wait exude timeless character and sophistication through their design simplicity, they reflect our commitment to providing beautiful and practical furniture options,” adds Tim. The new Tables Edit features ten distinct table collections that express individual style and personality. From dining and occasional tables; coffee and side tables, to low medium and high tables, plus a new bistro table, the collections convey the beauty and craftsmanship for which Lyndon Design is renowned. Alongside Pause and Wait, the Edit features the new ‘120’ low coffee table by award-winning designer, Mark Gabbertas. The Tables Edit is available now and can be downloaded via www.lyndon.co.uk For further information on Pause and Wait or any of the table collections, contact 01242 584897, or visit the Lyndon Design website.